I have a new video for you this month along with a new look on my blog. Hope you like both. 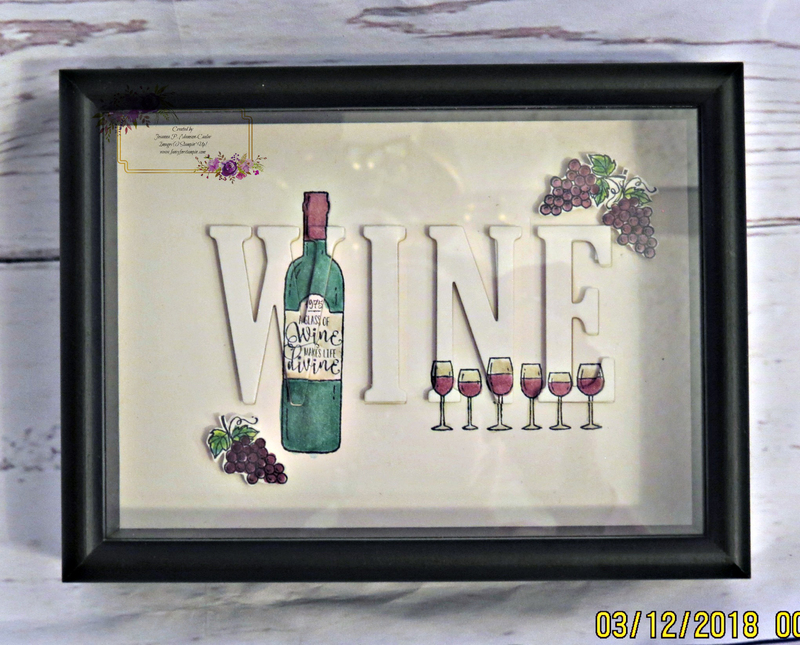 The video is on a piece of wall art I CASED and created using the Half Full Stamp Set and the STAMPARATUS! Wooo Hooo! I finally got mine, and when I did I realized it would be perfect to use on this project. The Half Full Stamp Set is a carry over from last year’s Holiday Catalog. The video is a little long, but it is definitely worth the time. I hope you enjoy making this project as much as I did. 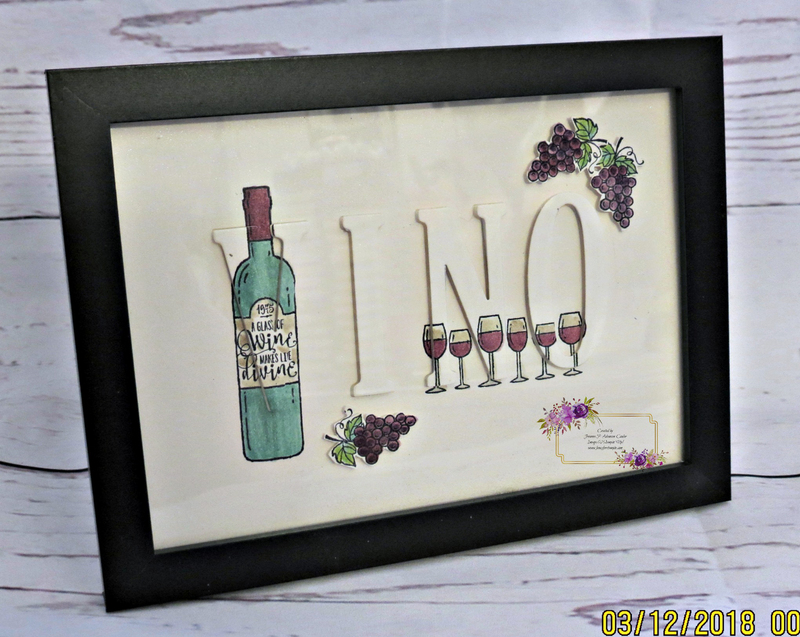 Two items that are not listed in the supply list at the end of this post is a 5 x 7 shadow box frame in black and some washi tape to tack down the edges of your card stock and your letters dies. 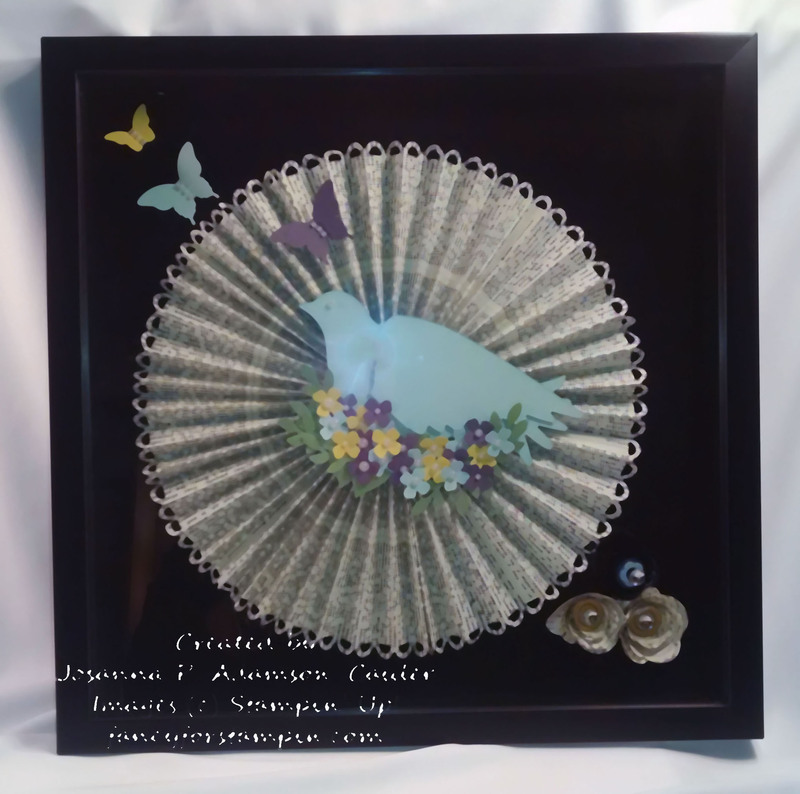 Now on the frame, as I show you in the video, you do not need a shadow box frame. 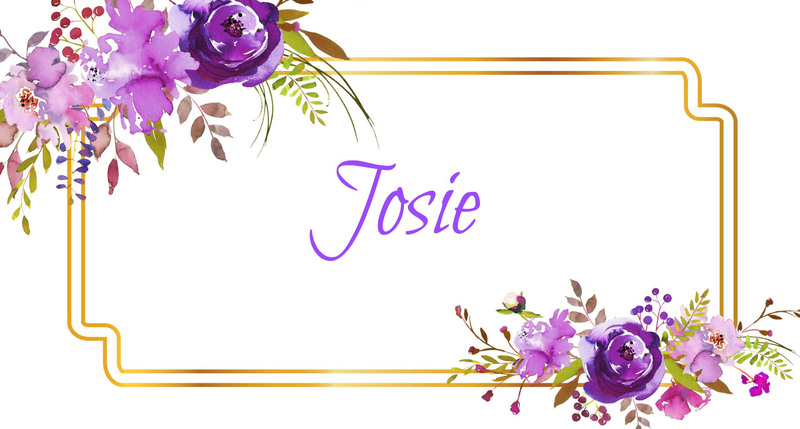 You can use a less expensive $3.00 5 x 7 photo frame if you choose. Your end product will be just as nice. Just a reminder that SALE-A-BRATON ends on the last day of this month so if there is anything you have been wanting, but you have been putting of purchasing, now is the time. Sorry about the glare and shadows in the following photos. No, I haven’t fallen off the face of the Earth, nor into a deep hole like you may have suspected. This is the first time since my last post that I have actually had a moment free to write something. The last two months have been extremely busy. It seems like that is always the case around the holidays. 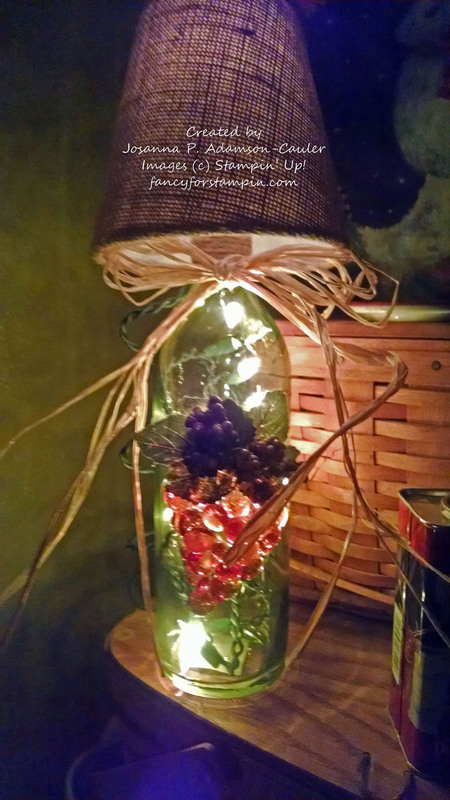 The days are usually a whirlwind of activity just for the holidays to be over in a heartbeat. At the beginning of November, I made a trip to Denver to help my daughter begin moving into her first apartment on her own. It is a cute little one-room studio apartment about a 20 minute drive from the Anschutz Medical Campus/University of Colorado, Denver where she will be attending nursing school beginning this Monday, January 4th. I am excited for her not only because she is beginning a new chapter in her life, but because she has her own place…something I always wanted for myself when I was her age. I eventually did get my own place, but not until much later as a single mom. The week before Thanksgiving, my husband was on his way to the grocery store for me when someone T-boned my car as he was crossing a major intersection in our city. It happened less than a mile from our home. I was the first major snow storm of our season, and I had promised him I would make oatmeal/raising cookies for him. He was thrilled because I never bake. He took my jeep because it was 4 wheel drive and did very well in the snow. The person that hit him ran a red light when she hit him. She totaled my car and shoved my husband into another vehicle that was also totaled. Fortunately for my husband, he was not hurt…just a few scratches. It happened in front of a fire station, so the paramedics came running out when they saw the accident. AND, a police car was sitting at the intersection when it happened and they saw everything! The person has since been charged with careless driving. My husband has to go to court later in January for the trial. So I got a new car (unplanned) for Christmas. Unfortunately, I am once again making car payments, so it isn’t like Santa brought a gift. Four days after the accident, my husband and I traveled back to Struthers, Ohio to spend the Thanksgiving holiday with my family and to attend my 40th high school reunion. We also traveled to Lancaster, PA to visit with Gary’s family. We were gone for 14 days. Traveling around the holidays was something I said I wouldn’t do again if I was hosting Christmas at home, but because of the reunion I made an exception. It was fun to see a lot of the people who were in my graduating class. Unfortunately many of my close friends from high school weren’t there. Maybe next time! I thought it was funny when I arrived at her place. My first reaction with her was, “Jenn, haven’t you done any unpacking? You’ve been here a month!” Her response was, “I’ve been waiting for you, Mom. I don’t know where to put anything. I need help.” I thought it was funny because had I tried telling her how to decorate or set up the furniture she wouldn’t have liked it, but she felt overwhelmed and it was Mom to the rescue. I. LOVED. EVERY. MINUTE.! Christmas Eve is usually the big celebration here. I am Italian, and I try to have a traditional Christmas Eve dinner for my family. My son arrived early on Christmas Eve, and we began cooking the various fishes at around 12:00. We have calamari, smelts, and shrimp, (not nearly 7 fishes) and a special Christmas Eve soup made with chick peas and chestnuts. Pasta is also on the menu. Salad, dessert, vino…a lot of vino! LOL! My husband and I have been married for 15 years, and in the last 5 we have finally been able to have the type of Christmas Eve I always wanted. It used to be me, him, my kids, and maybe some friends. Now it is family…just family…although friends would be welcome. We have my two children, his two, his (our) daughter-in-law, our 3 grandchildren, and…are you seated? His ex-wife, and my ex-husband come for dinner as well. I started shortly after my divorce to include my ex-husband in the holiday festivities because I realized then that he wanted to be with our children as much as I did. And the kids wanted him to be included. Gary’s ex was a different story. I tried including her early on, but she was resistant for her reasons. But in the last 5 years, things have changed so she comes to dinner as well. I always joke that we are ONE-BIG-DYSFUNCTIONAL-FAMILY, just like the rest of the world. Oh, I can’t forget to mention, that I got to meet my daughter’s new boyfriend and he was very nice. I look forward to getting to know him better if I am given the opportunity. Christmas day was quieter for us. It was just the two of us along with my son and his father. My daughter went to her boyfriend’s Mom’s house for dinner. We had friends over on New Year’s Eve and that brings us to today. Since I haven’t posted many of my Christmas cards, that is exactly what I am going to do today. I will also post a few photos of other things I have made recently. So…here goes. This card was CASED from the Annual Catalog. 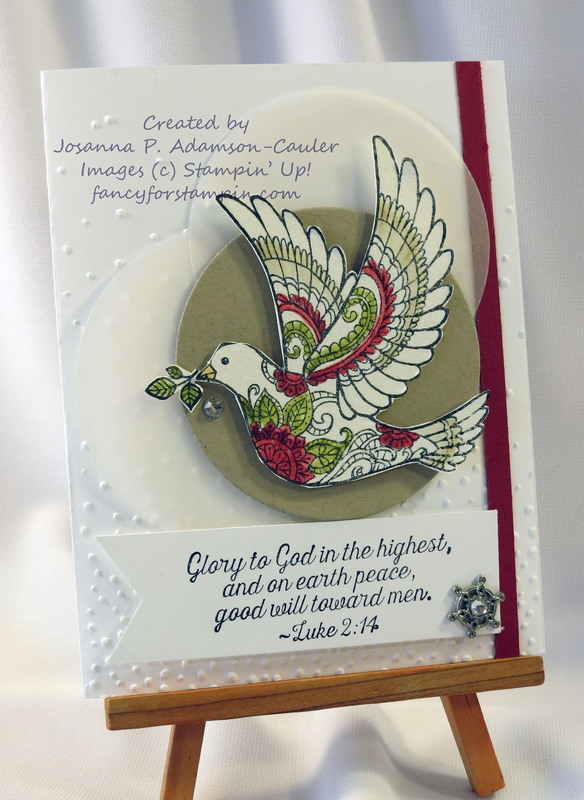 It features the Dove of Peace stamp set, Item #139800 and Winter Wonderland embellishments, item #139621. I CASED this card from a friend, Cathy. 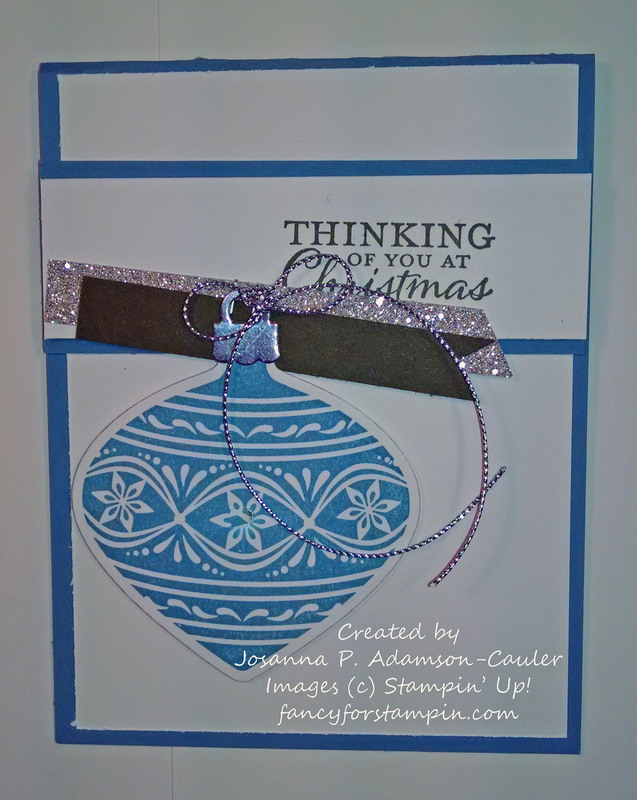 I used Embellished Ornaments stamp set #139756 and the Delicate Ornaments Thinlits Dies #139667. 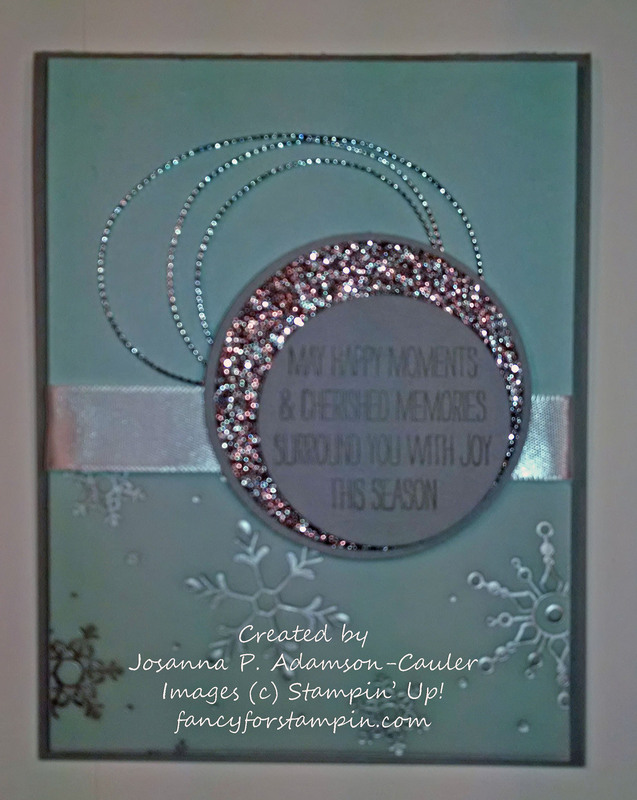 For this last card I used Jingle All The Way stamp set, item #139907, and Sleigh Ride Edgelits Die, #139670. If you have any questions about paper or ink colors, please email me. I would be happy to share any information I have relating to these cards with you. These next two photos are of two wall hangings I made for my daughter. She said she didn’t have anything to hang on her apartment walls. 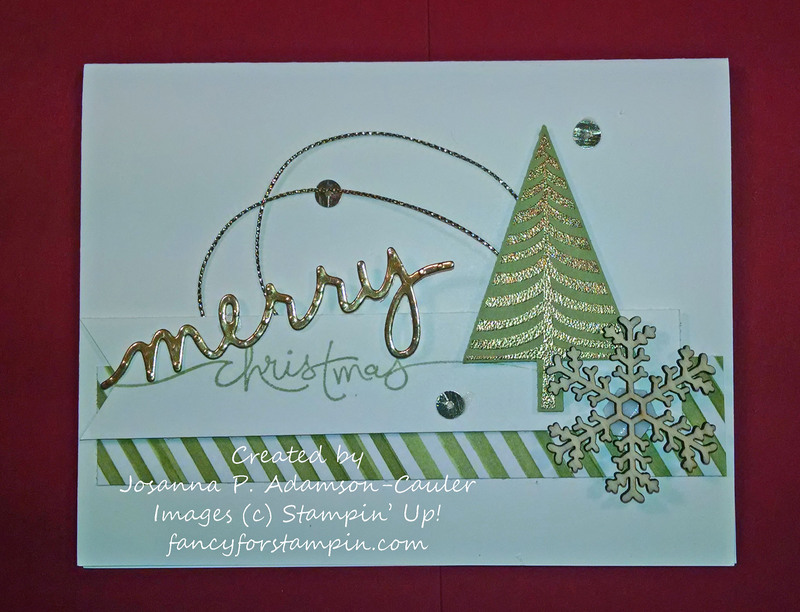 I made these the week before Christmas with some retired Stampin’ Up! products and two shadow box frames I found at a local store.